The bottom line when it came to Game 5 was this: The Maple Leafs needed to win, and it didn’t matter how. This was a strange game, and it was really difficult to get a feel for it in general. The Leafs came out and played like the desperate team they are, racing out to a two-goal lead (the team that has scored first has won every game in this series). They took their foot off the peddle a bit as Boston took over, and the Bruins were eventually rewarded in the second period to make it 2-1. The Leafs had an immediate and strong response, going up 4-1 just over two minutes after that goal. And then the game got weird. David Backes tried to pick a fight with Zach Hyman, and while you wouldn’t say Backes “jumped” him, he definitely caught him a bit off guard and got the upper hand as a result. Jake Gardiner tried to step in to help him out and almost got a full hard punch to the face from Zdeno Chara for his efforts. The end result was Backes went to the box, as did Hyman and Gardiner. No Chara, though. And the Leafs did not get a power play out of it, even though Backes initiated the whole thing in an attempt to spark his team. I think this really swung the complexion of the entire game. On the next shift, the Leafs took a penalty. Instead of the Leafs going to the power play up three goals, they were now killing a penalty. The Bruins dominated the power play, got another power play, and then with the momentum they gained, scored back at even strength. Shortly after, they got a lengthy 5v3 and were unable to convert. That left things at 4-2 going into the third period, and already people were thinking back to 2013. Six minutes into the third period, the Bruins made it 4-3. For the third period, Boston outshot Toronto 20-5; it was a relentless attack for the final 10 minutes, but the Leafs managed to hold on. Special teams have been a major storyline throughout the series, and while the Leafs were largely hanging on for dear life while killing penalties, they killed five of six and also scored on their only power play attempt. The issues with the penalties extend beyond just the actual penalties, though. As Mike Babcock put it, “The hardest part for us was we couldn’t get anybody on the ice, they just sat there and froze to death. Half the group was dying and half the group was freezing.” Mitch Marner and Auston Matthews played 15 minutes and change, Nazem Kadri played under 14 minutes, and William Nylander played under 13 minutes. It’s hard to put your big guys out in big moments at even strength when they are continually sitting on the bench for long stretches. 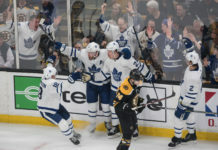 It’s also difficult to settle the game down, even after you have successfully killed off a penalty – as is what happened in the Bruins second goal. There’s a momentum boost there when a team dominates the power play without scoring. It’s sort of like running downhill. The TD Garden crowd gets fired up and it’s a full-on assault. The good news is that Frederik Andersen had easily his best game in months (given the circumstances, we could argue his best game of the season). He bailed the team out repeatedly and was swallowing up shots without giving out rebound opportunities. A few times, Boston had chances in tight and he was active with his stick knocking pucks away. There was also some luck and missed opportunity involved – particularly a Jake DeBrusk chance all alone in front in the final few minutes. But, then again, two of Boston’s goals were a direct result of lucky bounces. At the end of the day, the Leafs got the result they needed to force a Game 6. In the playoffs, that’s all that really matters. – The even strength shot attempts were 34-8 for the Bruins in the third period. I think when the Leafs go back and review the tape, the one thing that will stand out in particular was how easily the Bruins were gaining the zone. 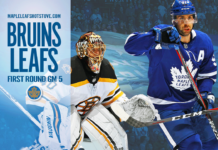 The Leafs ran a pretty basic 1–2–2 and the Bruins were simply skating through it and entering the zone. The whole point of a 1–2–2 is to force teams to dump it in, but the Leafs were really trepid in pursuit, which was very reminiscent of the 2013 game everyone kept getting flashbacks to. The first player has to pursue with purpose and angle the puck carrier in order to cut the ice in half. Instead, the first player was generally a formality that was easily skated around, leaving a bunch of open ice in the middle. – Part of the issue is that the Leafs had a lot of players playing heavy penalty killing minutes and they were gassed – and those are the same players they count on to protect the lead. Zach Hyman, for instance, played nearly five minutes shorthanded. – Zach Hyman has had a fantastic series so far and he has really gotten under the Bruins skin. I don’t think it was a coincidence that Backes went after him, as he’s had nice hits on Brad Marchand and Patrice Bergeron, digs away after whistles, and he has been a general pain for the Bruins to contain along the walls and around the net. At the end of the game, he made a great play to eat the puck the final few seconds and a scrum ensued after that. Watch his work leading to the first goal of the game here. He wins the battle down low to Brown to create a scoring chance, drives the net and turns Rask around in the process. He then takes the pass and feeds Matthews, goes back to the net, and three Bruins converge on him, giving Brown a little extra space to make the play and score. – Tuukka Rask bit hard on the short side shot fake by Auston Matthews because he scored on him with it a few games ago. It actually looked like he had a split second to do it again, and once Rask realized it, he overcommitted and that opened up the wrap-around and rebound opportunity. – Conversely, William Nylander and Nazem Kadri had a great give-and-go and Nylander made a good play to try to go post-to-post. It looked like he had the short side high shot wide open, though, and a more confident Nylander would’ve ripped that up top. Nylander scored in the second and third last games of the season, but that was a few weeks ago (April 5), and the playoffs have not been kind to him overall so far. That play was his only shot on net and he played under 13 minutes. He only played less than that twice in the entire regular season. – Auston Matthews was his most active with the puck this series so far – three times he picked it up in his own zone and weaved through the neutral zone, gaining the zone with confidence and creating offense in the process. Babcock’s line shuffling meant he actually played the most against the Riley Nash line — not the Bergeron line — and that meant a little more time and space to get going. I thought the play leading to the first goal got the team going, as did his forward-leading three shot blocks. Zaitsev played it like that in the second period, and although he ultimately took a penalty, it was better than a tap-in 2v1 goal. – Nikita Zaitsev, by the way, was out there with Brown and Hainsey for the big 5v3 penalty kill. Their strategy was pretty clear in that – they backed off the puck carrier and were really concerned with backdoor and slot passes, and it worked. The Bruins love cross-ice passes and the penalty killers did a good job picking guys up, communicating, and staying in tight. The Bruins did eventually make it 4-3, but it would have been a completely different game had they done it before the end of the second. I believe the thinking here from Babcock was to maximize two lines by keeping Tomas Plekanec between Marleau and Marner, as they were going, to see if he can get William Nylander going alongside Kadri. Ultimately, it worked out as Kadri setup a beautiful Andreas Johnsson goal, but Plekanec was not as good as he has been, including failing to record a shot on net and in general not threatening offensively or creating much. We’ll see if Babcock shuffles things around while having the last change at home again. I think we’ll see a really dialled in Rask with a big chip on his shoulder in Game 6. Andreas Johnsson looks really comfortable right now. Although he’s small, he’s relentless on the forecheck and not afraid to go to the dirty areas at all. That was a great net drive for his goal. Late in the game, he fumbled the puck in the slot, leading to the Bruins best chance to tie the game. I thought his night might be done after that, but Babcock put him back out there for one more shift. It says a lot about what Babcock thinks of Johnsson and how much he trusts him already. 1. I think I’d swap Nazem Kadri and Tomas Plekanec but otherwise keep the other lines the same. Babcock has kind of already alluded to this defensive swap because now he controls last change. On the road, it makes sense to balance the top line matchup between a Kadri-led line and Plekanec-led line, but it was really Plekanec that had the bulk of that matchup with almost seven minutes head to head. Plekanec was out attempted 12-3 versus Bergeron. At home, with last change, Babcock can control the matchups and Kadri is better than Plekanec, so he might as well load up and go from there. 2. I think we all have to realize the Tyler Bozak unit is the fourth line as they are a complete liability in their own end. They can score, as Bozak did at even strength and JVR did on the power play, but they can’t breakout or cover defensively. JVR, for example, did not even break even in shot attempts against a single player he played more than 2 minutes against at even strength. Bozak did for one. 3. I think the Leafs should keep stretching the ice with those long breakout passes to center but have a player come underneath the play with speed to try to bump it up to the target. The Bruins defensemen have been really aggressive stepping up on that pass, and there is a 2v1 or breakaway just waiting to happen. Get any center on the team skating full speed down the ice and put one on his tape on that play, and you have to feel good about that scoring chance. 4. If the Leafs get into penalty trouble again, I think I’d consider putting out Kadri for the odd faceoff to start it and get off right away — particularly on a night like last night, when Kadri finished 71 percent at the dot and Plekanec was at 41 percent. The Leafs overall leaders in forward time on ice were Hyman, Brown and Plekanec. Teams have their penalty killers and it kind of is what it is, but if you get into that much trouble again, it might be worth putting in a fresh faceoff man on occasion. 5. At the end of the game, the Leafs played Ron Hainsey 2:39 of the final 3:08. He helped get the job done, but I don’t think they need to rely on him that heavily in those situations, nor do I think he is good enough to lean on for over 26 minutes, as they did in Game 5 (which, again, was in part due to all the penalties). Travis Dermott played only 9:36 and got caught a few times in the neutral zone leading to scoring chances, but they have to find him some safe ice time and bring those Hainsey minutes down.